2/Al-Baqarah-142: The fools among the people will say: “What has turned them from their Qiblah [prayer direction (towards Jerusalem)] on which they were”? Say: “The East and the West belong only to Allah. He guides whom He wills to the Path (that leads to Allah)”. 2/Al-Baqarah-143: Thus We have made you a medium (just, balanced, good, superior, virtuous) nation, that you be witnesses over mankind and the Messenger be a witness over you. And We made the Qiblah (prayer direction towards Kabe) on which you were, only to (distinguish and) know those who depended on (followed) the Messenger from those who would turn on their heels. And it is surely hard except for those whom Allah caused to attain guidance (have Hidayet) (it is not hard for them); and Allah is not going to waste your faith. Truly Allah is Affectionate, the Most Merciful towards mankind. 2/Al-Baqarah-144: Verily, We have seen the turning of your face towards the heaven (waiting for the Divine Decree). Surely, We shall turn you to a Qiblah (prayer direction) that shall please you; so turn your face in the direction of the Inviolable Sanctuary (Al-Masjid Al-Harâm in Makka), and wherever you may be, turn your faces towards it. 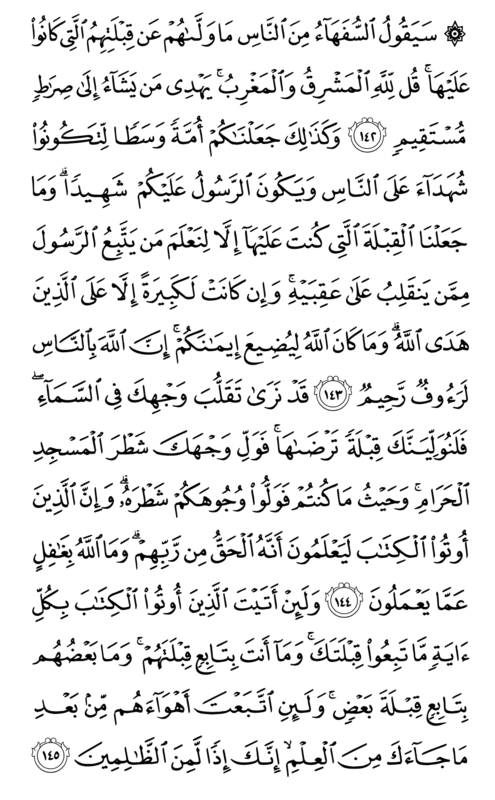 Those to whom the Book was given know this to be the truth from their Lord. And Allah is not Unaware of what they do. 2/Al-Baqarah-145: And even if you were to bring to those who have been given the Book every sign, they would not follow your Qiblah (prayer direction), nor would you follow their Qiblah; nor will they follow each other’s Qiblah. If, after all the knowledge you have been given, you follow their desires, then you would surely become amongst the wrong-doers (unjust, evil-doers).